Cursus monuments have a wide geographical distribution within Britain, stretching from Devon to Tayside in Scotland. They consist of two parallel lengths of ditches and banks, set at some distance apart, and are closed at either end, forming very elongated rectangular enclosures. They can vary in length from a couple of hundred metres to the grandest example of all, the Dorset Cursus, which stretches for over 10km. This monument’s course is rather unusual amongst its class, as it lies perpendicular to the prevailing local topography, which has a NE/SW axis. Image 1 – Mid-winter Solstice – Gussage Down. Image © Martin Green. Image 2 – Neolithic and Bronze Age complex around Wyke Down and the Bottlebush down terminal of the Dorset Cursus. Image © Martin Green. Image 3 – Dorset Cursus – Richard Bradley standing in the Northern ditch, which he uncovered in the Chalk Pit Field in 1984. Image © Martin Green. The South-West end crests the top of a ridge and during its North-Easterly course crosses two further significant ridges and three river valleys. The incorporation of natural features, particularly water, seem to be integral to its design. The three incorporated streams are close to their origins and only flow for a few weeks during most winters where they are crossed by the Cursus. Aerial photography has clearly shown that the ditches cut through two of these valleys with the course in the Gussage valley so far unresolved, which suggests a water table not dissimilar to today. In fact the Dorset Cursus is really two separate cursuses, both 90m wide, about 5km long, and built end to end. The earlier Southern or Gussage Cursus maintains a pleasing symmetry along its course. Descending from Thickthorn Down it crosses the Gussage valley and climbs up to the next ridge, Gussage Down, where it incorporates a long barrow at approximately its half-way point. It then descends into the Allen Valley before climbing up to near the top of the next ridge where it terminates. Interestingly, close to both ends, clear evidence of earlier Mesolithic activity has been found. Underneath the excavated Thickthorn long barrow, pits were found associated with worked flints, including a microlith found in the old land surface. In Chalk Pit Field, not far from the Bottlebush terminal, an important Mesolithic flint scatter was later overlaid by another of Neolithic date. It would seem that the two locations, with a long history as important places, were linked by the monument. Although by no means perfectly straight, major changes in the monuments alignment relate to points where it crosses the lees of hills (Bradley, 1986). At these points the proposed course would not have been visible for any great distance to those digging it, making it difficult to stay on line. This raises the possibility of simultaneous construction at different points, which were not intervisible. The ‘wanderings’ are corrected by significant dog-leg stretches when a much greater length is again visible. This is particularly apparent on Gussage Hill where the incorporation of the long barrow is of paramount importance. The Dorset Cursus – complete 10 km run. Image © Google and GetMapping. Crossing the Allen Valley at Down Farm a number of striking natural phenomena present themselves. The monument incorporates a Pleistocene river cliff, crosses the naleds (see Image 06) and closely skirts the shaft in Fir Tree Field, which we know was still partly open at this date. In this valley the Northern ditch, as seen from the air, has the appearance of a string of sausages. The likely explanation for this is that an earlier slighter ditch has subsequently been enlarged in sections, with not all of them being joined, leaving segments of the smaller ditch in between. However, no trace of the smaller ditch was revealed at the two points the Northern Cursus was excavated on Down Farm. These excavations examined the ditch on both sides of the River Allen some 650m apart, and revealed strikingly similar ditch profiles. Trapezoidal in shape, the ditch was 3m wide at the top, 2m at the bottom and 1.4m deep. Calculations based on the construction of the entire monument by hand give a minimum figure of of just under half a million work-hours. Radiocarbon dating of of animal bone samples found close to the base of the ditch has produced dates around 3300 BC, consistent with the small sample of plain bowl pottery found. 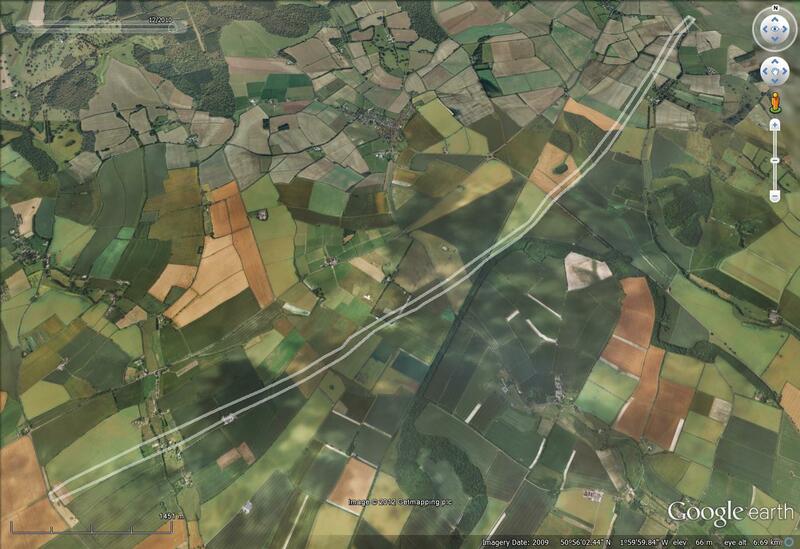 Image 4 – The River Cliff in Google Earth, with the Cursus mapped in. Image 5 – This ancient river cliff and seasonal lake were deliberately enclosed by the earthwork of the Cursus as it descended into the Allen Valley. Image © Martin Green. Image 6 – Trench through periglacial naled on Down Farm in 1976. Image © Martin Green. A few fragments of human bone also discovered might provide a clue to its function – a point to which we will return. Above the river cliff a slight knoll is strewn with Neolithic flintwork, the largest concentration along the whole monument. Here, excavations, as we will see later, revealed major secondary activity within the earthwork. Immediately below this cliff a lake forms for a short time during most winters and both features are neatly contained by the earthwork. From here the Cursus climbs uphill onto Bottlebush Down, where it ends some 400m before the crest of the next ridge. It was from this point, at some unknown time later, that the monument was extended for a further 4.3km, almost doubling its length and incorporating another river, the Crane. Again part of this river only appears above ground for a short time during most winters. The Pentridge Cursus covers even more terrain before ending, near further long barrows, close to Bokerley Dyke. The long barrows associated with the Cursus are integral to its design and many throw considerable light on the sequence of construction. For instance, the Thickthorn Down terminal is at an odd angle and is not squared off as is more usual. The reason for this seems to be that it was designed to share the same axis as the closest long barrow which we must assume was already in existence. The other nearby ’empty’ long barrow, also shares this alignment. As we have seen, the incorporation of one of the Gussage Hill mounds involved a considerable deviation in the course of the Cursus, which can only mean that this mound was already in existence. The inclusion, in the North bank of the Pentridge Cursus, of a long barrow near Oakley Down repeats this course of events in this later portion of the monument. Image 7 – North East end of the Cursus with mortuary enlosure geosphysics overlaid in situ. Geophysics image courtesy of Steve Burrow. Image 8 – South West end of the Cursus. Image 9 – The Pentridge mortuary enclosure geophysics. Image courtesy of Steve Burrow. The sequence at the North-East end near Martin Down appears to mirror that of the South-West Thickthorn end. Here the Cursus changes its alignment by 7 degrees, some 600m before the terminal, so that it can end near a long barrow. The island of grass which marks the locations of these monuments in a sea of arable crops today is easily mistaken as a single long barrow and not as the composite monument we know it to be. Aerial photography has recently revealed further monuments close to the North-Eastern end of the Cursus. These, now confirmed by geophysics, consist of a mortuary enclosure about 100 x 25m, open at its Eastern end and abutting a short long barrow at its Western end. A further well preserved long barrow lies 200m to the South, the axis of which is aligned upon the Cursus terminal. About 300m to the north of the terminal lie the ploughed remains of a further small long barrow which may have been enclosed within a stone circle. During Colt Hoare’s brief examination of this mound he described it as ‘surrounded by sarsen stones’. Indeed, even now I have noticed large lumps of sarsen ploughed to the surface around the edges of this mound. Putting all this evidence together it would seem that the Cursus was built to form a grand avenue between existing groups of long barrows. Enlargement of the ends of the Cursus seems to suggest a need for the terminals to imitate the proportions of the neighbouring long barrows, thus inextricably linking the two monuments in the minds of of the people. This arrangement was embellished by the addition of further mounds built either on the same alignment as the terminals, or pointing at them. The bank, probably revetted by turf or chalk blocks, and ditches of the earthwork act as a barrier. Access to the most significant points of the monuments would have been restricted thus reinforcing the special status of any observers. Hard evidence for any ceremonial activity is scant but does include the discovery of human bones within the ditch, suggesting excarnation areas may have been present, where bodies were left to naturally decompose. The most important feature of the whole monument is, however, the alignment of the Gussage Cursus which lines up perfectly with the movement of the sun at the mid-winter solstice. The North-Eastern end of this monument terminates just below the ridge on Bottlebrush Down. Observers standing here and looking back along the course of the Cursus, which would have presumably been kept clear of vegetation, could watch the mid-winter sunset directly behind the silhouetted long barrow on Gussage Hill. This spectacular skyline effect would have been lost had the terminal been placed on top of the ridge. A favoured observer could watch the setting sun disappear behind the long barrow and be linked directly to the ancestors and to the Cursus itself creating a monumental avenue of the dead. The ancestors associated with the movement of heavenly bodies would become immortal and part of nature itself. Further symbolic meaning is manifest in the position of the Cursus along the spring line where annual flooding events were partly enclosed within the monument. By linking their ancestors with the forces of nature, and the movements of the heavenly bodies through one grand structure, certain individuals were trying to gain control, or appear to have control, over life itself. Undoubtedly restricting access to the North, the Cursus may have marked the upward limit of settlement at that period. Certainly the great concentration of contemporary settlement debris comes from the South in the Bournemouth basin area of the coastal plain. It is not until later in the Neolithic, presumably when the Cursus has fallen into disrepair, that significant expansion takes place on the high ground to the North. But even in disrepair, as we shall see, the Cursus continued to exert a magnetic influence over the way the ritual landscape was organised for a further 2000 years – an astonishingly long time when measured in human lifetimes.